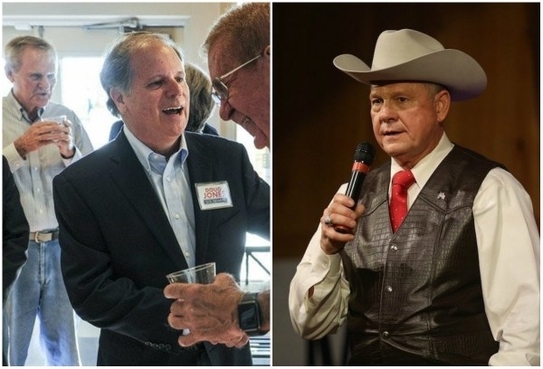 Democrat Doug Jones (left) and Republican Roy Moore are running in Tuesday's special election for the US Senate. IT IS A SIGN of the blindly tribal partisanship of our age that Alabama Republicans continue to support a US Senate candidate as grotesque as Roy Moore. At least six women have accused Moore of sexual misbehavior with them when they were teenagers and he was in his 30s; the allegations range from the merely creepy to the downright criminal. Evidence substantiating the allegations seems solid, much of it carefully reported by sober news organizations. Moore's response to the charges has been inconsistent. At first he acknowledged having dated "a lot of young ladies," said he "didn't dispute" that some of them were teens, and recalled two of them by name. Later he reversed course, claiming that every allegation is "completely false" and "malicious." He now insists — untruthfully — that he does "not know any of these women [and] did not date any of these women." Nevertheless, a CBS News poll shows, an overwhelming 71 percent of Alabama Republicans say the allegations against Moore are false. More than 80 percent of Republicans say they plan to vote for Moore. And though a narrow majority (53 percent) concede that the teen-molesting charges are a "concern," they intend to vote for Moore because "other things matter more." What other things? Here's a clue: The Moore campaign identifies the Democrat in the race, former prosecutor Doug Jones, with the Twitter hashtag #AbortionJones. If any single issue is front and center in the Alabama Senate race, it is abortion. 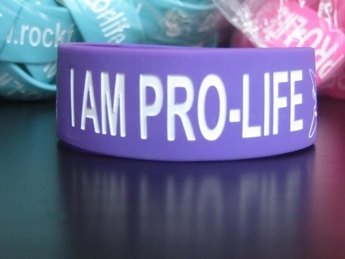 Nearly 6 out of 10 voters in the state believe abortion should be illegal in all or most cases, making it, in Politico's words, one of the "five most pro-life states in the country." Campaign ads regularly remind voters of Jones's extreme view on abortion: When he was asked on "Meet the Press" what limits on abortion he would consider appropriate, he responded by proclaiming his support for women's right to "the abortion that they might need." When Jones was asked specifically about restricting late-term abortions, he balked: "I'm not in favor of anything that is going to infringe on a woman's right and her freedom to choose." A bit defensively, he added: "That's just the position that I've had for many years. It's a position I continue to have." Answers like that put Jones well beyond the Alabama mainstream on abortion. For many voters, it's a deal-breaker: They would rather vote for a candidate credibly accused of having sleazily preyed on teenage girls than for a pro-choice hardliner who won't accept any legal restriction on abortion. Were Jones not committed to such a maximalist stand, it's likely that he would be peeling away more GOP votes. One political operative who makes that argument is Jared Arsement, an up-and-coming Democratic consultant who helped John Bel Edwards defeat Republican David Vitter in the 2015 Louisiana governor's race. Like Moore, Vitter was tarnished by sexual scandal: When he served in Congress, he was exposed as a frequent patron of prostitutes. Like Alabama, Louisiana is now staunchly Republican. But unlike Jones, Edwards breaks with his party on abortion, presenting himself instead as a "pro-life Democrat" in the mold of the late Pennsylvania Governor Robert Casey. That made all the difference, Arsement told The New York Times last week. Had Edwards run on a pro-choice platform, "Vitter would have won that race, there's no doubt in my mind." Instead he lost, making Edwards that rarest of birds — a Democrat holding statewide office in the Deep South. Because he is anti-abortion, Roy Moore has the support of the great majority of Alabama Republicans. But will electing a candidate as compromised as Moore advance the pro-life cause — or irreparably tarnish it? Moore's election will almost surely prove a Pyrrhic victory. Gracy Olmstead, a Christian millennial who describes herself as having "been part of the pro-life movement since childhood," trembles at the thought of what electing Moore will do to a movement she cherishes. "How can pro-lifers say they care more about women and their welfare when they vote for child molesters and sexual harassers?" she asks. She sees the coming backlash: "Voting for loathsome politicians will distance swing voters from the GOP — and, more importantly, from the pro-life cause most often associated with it." For Alabama voters earnestly opposed to abortion, a victory Tuesday by Doug Jones would be a catastrophe. The bitter irony — for Republicans who care about their party's image, for social conservatives who care about their cause — is that a victory by Roy Moore will be even more catastrophic.